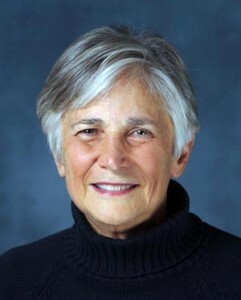 Celebrated educational policy analyst Diane Ravitch told a group of North Carolina educators and public school advocates Saturday that standardized tests scores often reflect family income, with wealthier students outperforming their poorer counterparts. But Ravitch, noting the recent academic scandal involving wealthy parents who paid millions of dollars so their children could gain admission to a top university, said that isn’t always the case. “Now we saw with the recent cheating scandal for the college boards, there are lot of dumb kids whose parents are rich,” quipped Ravitch. The scandal to which Ravitch referred involved more than 33 parents, including Hollywood stars and wealthy CEOS, who took part in a scheme to cheat on the SAT and ACT to help their children gain admission to top universities. Ravitch made her comments via Skype during a “community conversation” in Raleigh to discuss the toll excessive testing has on teachers and students. Dane West, a Lee County teacher, said the culture of testing can destroy a child’s dream as early as third-grade. West said children in the third-grade who don’t pass end-of-grade tests are being told they’re not on a path that will lead to college or a meaningful career. Suzanne Miiler, founder of NC. Families for School Testing Reform, poses for a photo during a March 16 community conversation about the toll of excessive testing on students and teachers. Meredith Pinckney, a Wake County agricultural science teacher, said her students aren’t tested but she sees the impact excessive testing has on them. Saturday’s event was hosted by N.C. 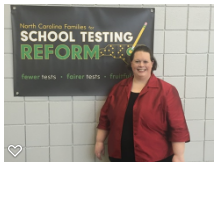 Families for School Testing Reform (NCFSTR), Save our Schools NC and Jen Mangrum, a candidate for State Superintendent of Public Instruction. Several dozen educators attended the community conversation as well as a handful of elected officials, some of who later sat on a panel to discuss the state of education in North Carolina. Ravitch said students from low-income households who perform poorly on standardized tests don’t do so because they don’t have the brains to score well. “Children who grow up in poverty are likely to have low test scores, not because they’re not smart but because they’re hungry, or they haven’t had decent medical care, they’re growing up in situations that are disadvantageous to their health and well-being and that affects their test scores,” Ravitch said. Federal and state leaders have given too much weight to standardized tests, Ravitch said. She said the tests are often flawed and shouldn’t be used to measure student and teacher success. In North Carolina, State Superintendent Mark Johnson has announced new initiatives to reduce the amount of testing currently required of students in North Carolina’s public schools. Johnson has pledged to reduce the number of questions on tests, reduce the time students must sit for tests, change testing policies to reduce the stress at schools, work with local leaders to reduce the number of locally required tests and push to eliminate tests not required by the federal government. A survey about testing conducted by Johnson’s office found that 78 percent of the roughly 42,000 parents who responded said their child takes too many tests. Seventy-six percent of teachers who responded said North Carolina’s public school students were being tested too much. And the State Board of Education is weighing the elimination of the state’s fourth grade exams in science and social studies and the fifth-grade exam in social studies as way to reduce the amount of testing in North Carolina Schools. Critics of high-stakes, standardized testing said they understand some testing is needed, but believe the state now requires students to take too many exams. “We’re concerned with the excessive testing that is putting a strain on our children, it’s bringing shame to them, it’s putting them in environments that are not optimal for their learning and social-emotional learning,“ said Suzanne Miller, founder of NCFSTR. Miller said Saturday’s event was a first step toward raising awareness about excessive testing to bring about a cultural change. State Sen. Floyd McKissick, (D-Durham) said the General Assembly must address the fact that many teachers feel they’re teaching students to only pass standardized tests. Imagine children thinking they’re ‘dumb’ because they performed poorly on standardized tests. One teacher said it happened at her school. When you’re a 1st grade teacher and you have colleagues who want to pull out a “test ready” style workbook to use as pedogy, something is terribly wrong.